This weekend I spent the weekend in New Hampshire (where I am from) with my family celebrating my Dad’s 65th birthday. We had a small gathering of family and friends on Saturday afternoon to celebrate this momentous occasion. I had fun decorating for Dad's party, I hand cut his birthday banner and made little labels for all of the food dishes. Family and friends made this day very special. My Dad had a great time chatting it up with everyone! One of his gifts from a family friend was an "x-large" remote for the television. Of course I had to bring home a cake from work, it would not be a celebration without it! 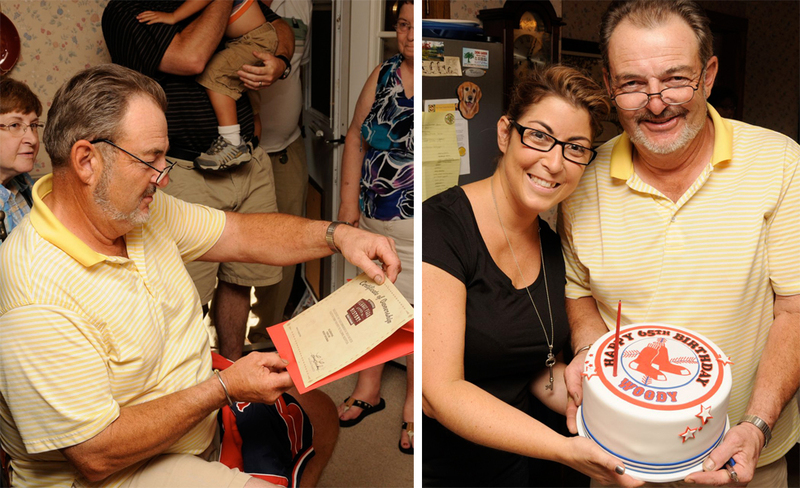 The cake was decorated with the Boston Red Sox logo and a birthday inscription. As a group gift, we all contributed to buy my Dad a brick that will be part of Fenway Ball Park in Boston Massachusetts. Being from New England we love our sports and my dad is a big Red Sox fan. On the left my Dad is opening his certificate for his Fenway Park brick. On the right, my Dad and I with his cake, of course it's filled with his favorites: chocolate cake with crunchy peanut butter filling, gooey caramel and dark chocolate ganache. Happy birthday Dad!!! Thank you Rebecca for sharing this very special day with your family and dad. You are a wonderful daughter to them for sure. Mmmmm cake! You and your dad are so cute together!